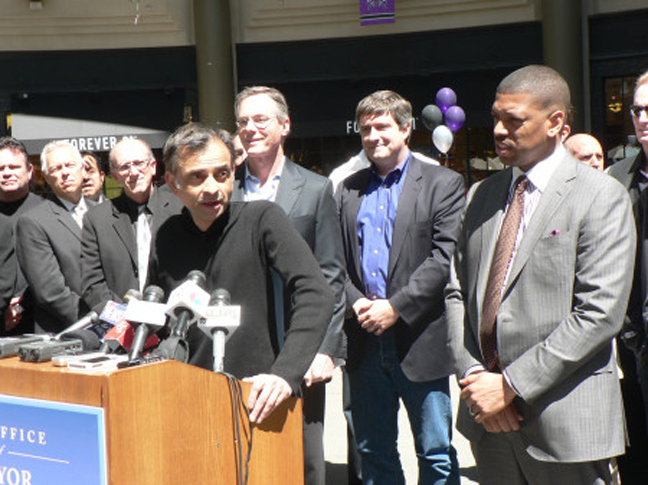 DOWNTOWN SACRAMENTO — It’s no joking matter when the Sacramento Kings principle owner Vivek Ranadivé says time after time that he likes to surround himself with people “smarter” than he is. Based on his professional background, the self-imposed discipline Ranadive endorses has been an effective tool for the software engineer and the companies he has built. Ranadivé has been making some productive personnel changes since he took over the reigns of the Kings. He is also showing his commitment to diversity during the process. It’s a procedure that should fit the Sacramento region and its humanly inhabitants perfectly. What Ranadivé is specifically “carrying over” to the Kings’ operation is obviously the business model that works for TIBCO Software Inc., his 16-year-old software company headquartered in Palo Alto. Ranadivé’s first company he founded in 1986 is Teknekron Software Systems. TIBCO, short for The Information Bus Company, provides infrastructure software for companies to use on-premise or as part of cloud computing environments. TIBCO employs its trademark’s products to supply companies the “two-second advantage,”which is the ability to retrieve information instantly and act on it to gain a competitive advantage. TIBCO has more than 4,000 customers worldwide that count on the software company to act as a steward for information, decisions, people, and data in real time. Ranadivé’s high-level management team and staff includes people of all different races and gender. Former San Francisco 49ers great Roger Craig is one of the Kings’ owner best friends and business associate. With the inclusion of 160,000-plus African Americans, the Sacramento region boast more than 2.5 million people and has a diversity pool that may exhibit a face from every corner of the globe. Ranadivé likes that human-facade factor of Sacramento. He made references to the region’s diversity as a form of popular music or a gumbo mix. The Kings’ ownership group, Ranadivé cited, is a mixture of backgrounds within itself. Youtube co-founder Steven Chen (Taiwanese American), the Jacobs family that founded Qualcomm (Jewish Americans), and former NBA star Dr. Shaquille O’Neal (African American) are a part of the Kings ownership group. Ranadivé is from the of India, the second most populated country in the world. TIBCO and the Kings, as diversified as they are, is a only a key component of Ranadive’s repertoire. He is persistent in hiring the best people that are qualified for the position. People with different ethnic backgrounds is a plus, though performing the tasks with competent skills is a must, Ranadivé said. Leslie Moore, TIBCO Software Inc.’s Director and Global Head of Corporate Communications and a graduate from Fresno State University, said the company’s diversity makeup stretches around the world. TIBCO is global and has offices all around the planet earth. Sacramento Mayor Kevin Johnson expressed that Ranadivé’s Kings could be a definitive reflection of TIBCO. Johnson said Ranadivé built his company and reputation on finding the cream of the crop to implement the business’ vision and organizational infrastructure. Ranadivé is completely changing the whole Kings organization’s culture from top to bottom. “I think that most people realize that if you want to build a high-performing company or high-performing sports team…diversity is in your best interests,” Johnson said. “You want to get the best and the brightest. But when you have different perspectives…certainly you’re able to do that (perform at a high level). And certainly, (Ranadivé) is able to tout his success in Silicon Valley. I’m sure that same kind of broad-based approach, diversity and perspective, will be a part of what he brings to the Sacramento Kings’ franchise,” Johnson stated. In regards to building the Kings back into a winning franchise, Ranadivé also shared that the team is operating under a mission statement that relies on enhancing lives, reaching the lives of those it touches “and to make the world a better place,” he said. Along with the mission statement, excellence, integrity, hard work, openness, and amusement values have been incorporated into the franchise to ensure everyone is making a contribution and commitment to put out the best product possible. “We’ve laid all this out and everybody has bought into it so that we are all on the same page,” Ranadivé said. “The analogy I make is that the 20th century model ­leadership was a marching band where everybody robotically marched to the beat of a single drum. The 21st century model that I subscribes to is more jazz. Everyone can contribute, do their own thing, and sometimes improvise. But at the end of the day…what occurs…is beautiful music,” Ranadivé stated.